Get FormLift Payments and 12 more included in the discount All Access Pass! Over $800 in annual savings! Are you tired of paying massive monthly fees for tools like GoSpiffy? But you need a better solution than the standard Infusionsoft Order Forms? FormLift Payments could be exactly what you are looking for! FormLift Payments is the FIRST WordPress API order form solution built specifically for Infusionsoft Users. FormLift order forms can be hosted on your WordPress site, and allow for easier setup, better styling, and more features than other Order Form Tools. Better Styling, Mobile Responsive, Easy Setup. With FormLift payments, you can be confident that your order forms will instill trust with your potential customers. They are secure and hosted on your website unlike the hosted order forms or Spiffy. whether you already have FormLift or not, if you're thinking that you might need FormLift Payments, you can get 10% OFF by completing our 6 step guided setup! Reasons To Use FormLift Payments! By pulling the styling settings from FormLift, this plugin will look and feel exactly like your website, or landing page! Since FormLift payments is run by WordPress, the order forms will be on your domain which will build more trust with your customers! You can use it on any page! Since FormLift payments is run by FormLift, you can use the order forms on any WordPress page and is compatible with every theme! The direct integration with Infusionsoft means you do not need to setup any additional merchant accounts, and can start processing payments through Infusionsoft instantly. You can edit your products directly in the backend of WordPress, allowing you to make last minute changes without having to login to Infusionsoft. 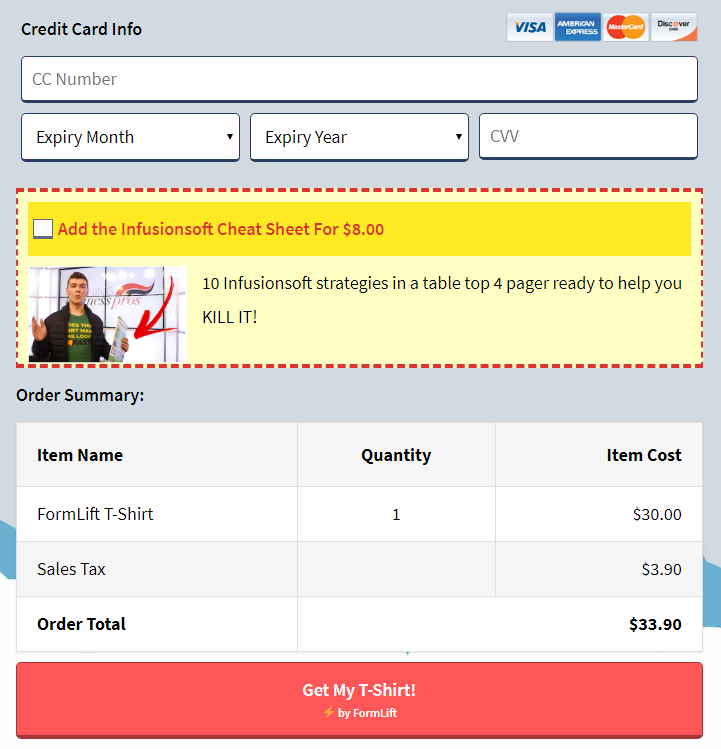 FormLift Payments is completely API driven, so you don't even need the Ecommerce Module in Infusionsoft. FormLift Payments simply allows you to add order form field to existing web forms. FormLift payments is API driven, meaning you do not even need the Ecommerce module in Infusionsoft! You can add product fields, credit card fields, billing address & shipping address fields, order bumps and more! Plus, don't be hindered by pre-built templates. You can organize your fields in any configuration. 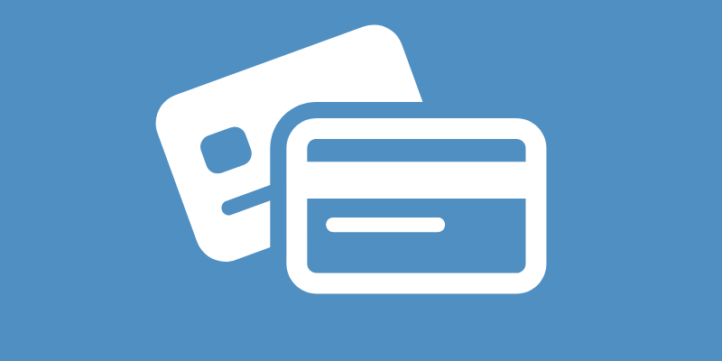 FormLift Payments has a WordPress backend product management system. You can change the name, price, subscription options, or trial days without ever logging into Infusionsoft. Giving you the flexibility to sell the same product at different prices to different people while launching the same automation. FormLift Payments creates stylish beautiful payment forms by providing you with the tools you need to make it your own way. Use FormLift's already built in styling settings to style your order from fields. plus some new fields for the Order Bump. FormLift Payments allows you to get it right! 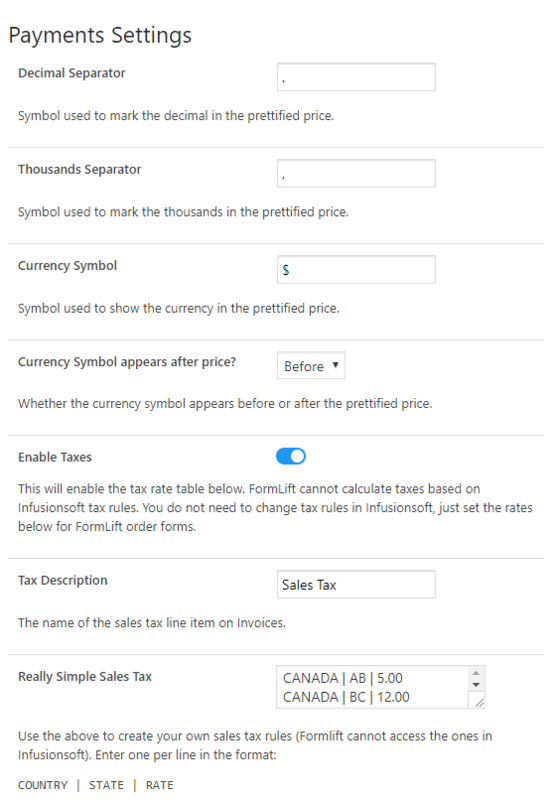 Edit's FormLift's settings to get Currency symbols right, taxes right, and much more. Create more sales with One Click Upsells. FormLift payments offers full support for 1 click upsells. Just use the One Click Upsells extension to generate secure encrypted links which you can use to sell products AND subscriptions after any FormLift Payments purchase! Do I need to setup another Merchant Account? No, FormLift Payments uses whatever merchant accounts you have available in Infusionsoft. Is FormLift Payments PCI compliant? In short, yes. Given that your server is also PCI compliant. You may want to invest in additional security measures if you are processing lots of orders. An SSL certificate is required to use FormLift payments. Can I choose which merchant account is being used? Yes, you may choose the merchant account to use by selecting it in the Credit Card Field which is what launches an order. FormLift does not charge any additional fees for payments. No there are no usage limits! 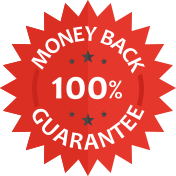 We are so sure you’ll be happy with your purchase that we offer a “30-Day Money-Back Guarantee” to ensure customer satisfaction of FormLift Payments. If for any reason you wish to discontinue using FormLift Payments, we will promptly issue a refund. Does FormLift Payments support promo codes? If so, is it just a single promo code, or can I batch upload a series of promo codes? It does not support promo codes since that feature isn’t available through the API. But you can modify the prices of products directly in FormLift, and have multiple instances of different prices to accommodate sales and such. Thanks for finally talking about >FormLift Payments – FormLift Extensions <Loved it!